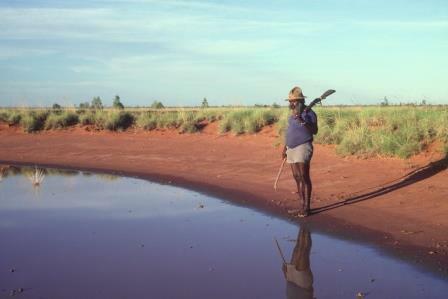 Jimmy Pike was born circa 1940, east of Japirnka, an important waterhole in the Great Sandy Desert. 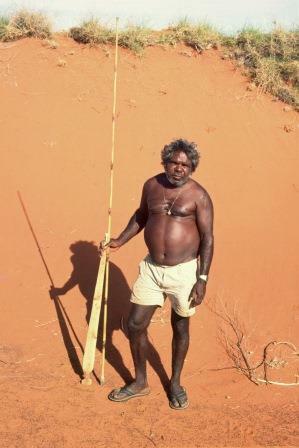 He grew up living a traditional life, learning the Law of his Walmajarri ancestors. 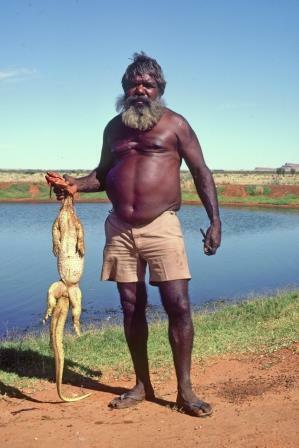 As he and his family moved through the desert country on foot, Jimmy was taught knowledge handed down through generations: the names of waterholes, animals, birds and plants, and their stories, cultural significance and uses. The arrival of European settlers in the Kimberley brought an end to the age-old desert life. In the 1950s, Pike and his family joined the drift north to the sheep and cattle stations of the river valleys, where life was reputed to be much easier than in the sandhills, and food more plentiful. After living for a time as a fringe-dweller in the hills around Cherrabun Station, he eventually joined his relations in the station camp. He worked as a stockman on Cherrabun and many other stations around the Kimberley. During this time, Pike was exposed to both Christianity and alcohol. The latter got him into trouble with white law and he served a number of years in prison, first in Perth and then nearer home, in Broome. 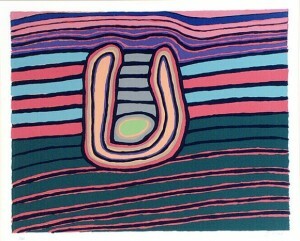 While in Fremantle Prison, Pike joined art classes and learnt to paint and make lino prints. He developed his own unique style and soon became well-known, through exhibitions of his work and through Desert Designs, the fashion label that used his designs on fabric and other goods. Back in Broome Prison he met Pat Lowe, who was working there as a psychologist. Lowe later joined him in his desert camp and shared his three years of parole. Later, the pair returned to live in Broome, but kept their small camp in the desert and went back there from time to time. As a Native Title claimant Pike took part in field trips and was one of the painters of the famous Ngurrara canvas, which was used as a map in the claim. Akerman, Kim. 2010. 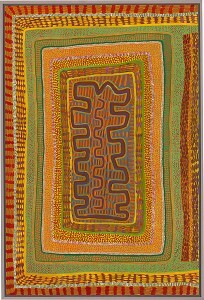 In Franchesca Cubillo and Wally Caruana (eds) Aboriginal and Torres Strait Islander Art: collection highlights. National Gallery of Australia: Canberra. 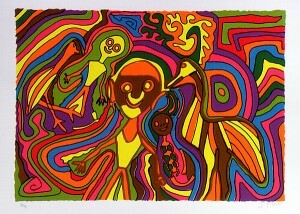 In later years, Pike travelled to a number of other countries to hold exhibitions of his work: the Philippines, China, Namibia, Italy and the United Kingdom. Wherever he went, he made an impression through his art and his personality. Pike and Lowe collaborated on a number of books based on Pike’s life, which he illustrated. Pike died suddenly in 2002, but his work continues to be exhibited and remains popular in the fashion world through the Desert Designs label, demonstrating his enduring influence and relevance.